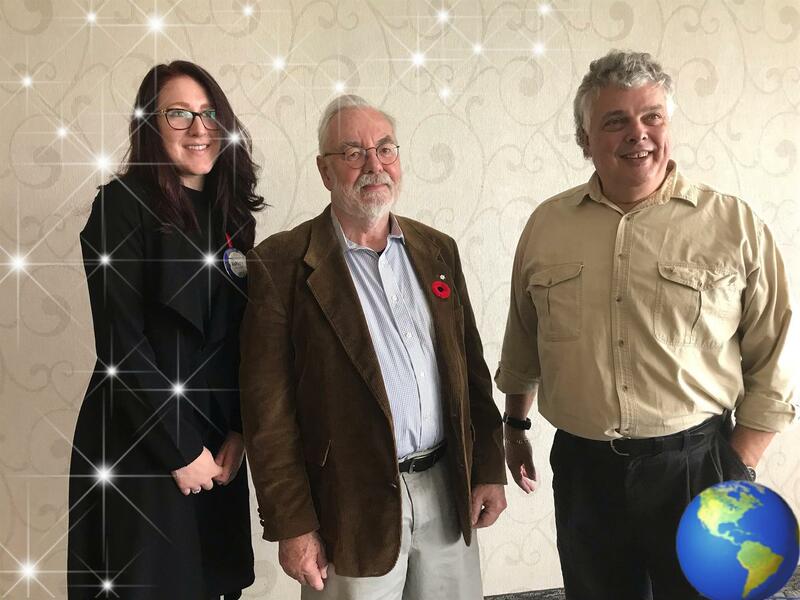 Today's guest speaker, Terence Dickinson (pictured here with Ashley Rushnell and Bill MacKay, stars and all), was introduced by Bill MacKay, who purchased his first copy of Nightwatch - a Practical Guide to Viewing the Universe in the early 1980's. Bill admitted to perhaps being geeked out when he painted his flashlight bulb a shade of red nail polish, not entirely sure whether the polish might be red enough. He headed outside to view the night sky and it worked! His night vision wasn't affected and the information needed from Nightwatch was visible. Bill was hooked. Terence is a Canadian astronomer and accomplished astrophotographer who lives near Yarker, Ontario. He is the author of numerous astronomy books for both adults and children, selling over two million books. He is the editor of SkyNews magazine, which he founded in 1995. Dickinson has been an astronomy commentator for Discovery Channel Canada and taught at St. Lawrence College. Terence has made appearances at such places as the Ontario Science Center. The steroid 5272 Dickinson is named after him. Terence became interested in astronomy at age 5 after seeing a bright meteor. When he was 14 he received a telescope as a Christmas present, the first of nearly 20 telescopes he has owned. Past occupations include editor of Astronomy magazine and planetarium instructor. He became a full-time science writer in 1976. The Royal Canadian Institute awarded him the Sandford Fleming Medal in 1992. In 1995 he was recognized and became a member of the Order of Canada. A very distinguished gentleman to say the least. Terence and his wife were both born in Toronto, but paradise to him is living in the country. Population density decreases with every km the farther you get from Toronto. A wonderful place to live, hear the birds and the wind in the trees. Terence was 5 years old, living in Leaside when he first noticed the dark sky with stars. He was intrigued. The question he asked at that young age "What are the stars?" has never gone away. His 1st grade teacher could not answer the question, but his Grade 2 teacher took him to the library and pointed him in the direction of some science books. He found a book written by an author titled "The Stars for Sam". There Terence found the statement that stars are suns mostly bigger and brighter than our own sun. When man landed on the moon, we went from knowing nothing about the universe really to a whole new frontier. The space program photos showed one active body (earth) and one dead body (moon) and it hasn't changed for billions of years. The earth is teeming with life, but we hadn't seen it from afar. We live in a dynamic world and we do not know of any other place where that is the case. Earth is the only place in the universe where life exists. Terence has written 15 books altogether, his first being Night Watch - A Practical Guide to Viewing the Universe. He said Zwick's is protected enough to get a good view of the sky as well as a dark sky viewing area in Lennox and Addington, on Highway 41. Terence designed a place there for star gazers. The area is well signed and has become the most visited place in that county. It's less than an hour's drive from Belleville and is open 365 days of the year. He travels to other places around the globe, one mountain in the desert in Chili where there is a VLT -- Very Large Telescope, actually the telescopes there are five stories high! And on his travels, Terence conducts research for his books and magazine articles. Ashley Rushnell thanked Terence for sharing the places he has been and the galaxy of knowledge of the sky.